We have been listening to you and this program was something that had been requested by practitioners for a long time, even prior to the INDIGO. So this was taken into consideration when the INDIGO was developed. We wanted to create a program that would be able to run a fully automated session–something that could be occasionally substituted for the more in-depth, detailed, personalized sessions that practitioners typically run. INDIGO users now have another option. 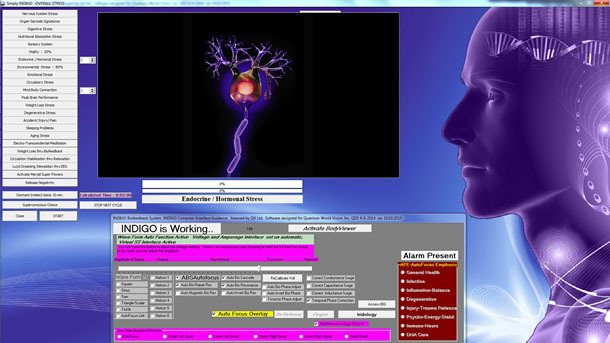 The feature was developed and added to the already incredible INDIGO Biofeedback System in late 2011. When the program was introduced it had 17 different programs options to choose from, since then the list has expanded to 24. Practitioners are now able to pre-select from the program options that once set up, will run “hands free” for 90 + minutes. Wow! All as simple as setting up a “play list”. Practitioners can go through the list of program options, make a choice and then individually set the number of minutes for that button selection. Each of these can be set from 1-15 min except for option # 24 which is a 10 minute option. If a mistake is made, a selection can be removed from the “play list” simply by clicking the button name which removes the timer, taking it off the “play list”. Once the Start button is clicked the selected choices will begin to run, with the accompanying graphic displayed. It starts with the choice closest to the top running downwards toward the bottom choice, regardless of the order they may have been selected in. This program placement was set up by design for a particular reason. The choices towards the top of the list are preparatory work for the choices that might come later. This allows the session to flow in a practical order, maximizing overall client benefit. In later development an Unconscious Choice option was also integrated. Clicking this option will reveal a recommended choice, specifically beneficial for the client.